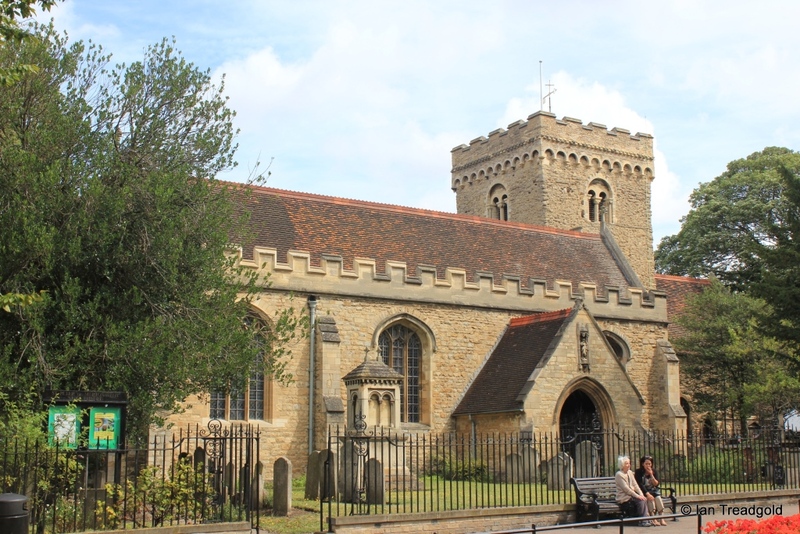 The church of St Peter de Merton is situated to the north of Bedford town centre at the junction of the The Broadway (A6) and St Peter's Street (A4280). The patron saint of the church is St Peter and the de Merton qualifier was added to avoid confusion with another St Peter in the town, St Peter de Dunstable which was to the south of the river. 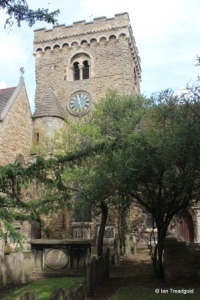 The church was originally in the advowson (the right to appoint clergymen) of Merton Priory in Surrey but then vested in the Crown with the dissolution of the monasteries. 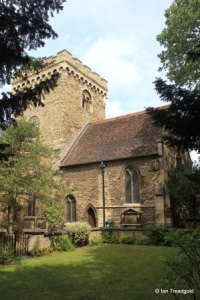 The church was originally of Saxon origin with a simple nave and then west tower. 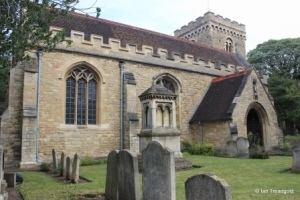 It was then modified in C12 to add a new nave to the west of the tower. In Victorian times it was extensively modified and restored to add aisles to north and south. The total length is around 103 feet with the chancel being around 18 feet wide, the nave 24 feet wide and the two aisles 14 feet wide. The tower is around 17feet square and some 47 feet high. 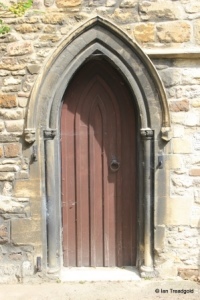 There is a south porch and narthex or enclosed porch at the main west end. 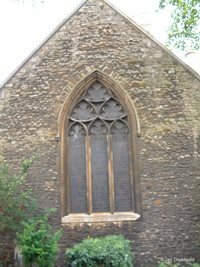 There is also a modern vestry and chapter house to the north-east side. 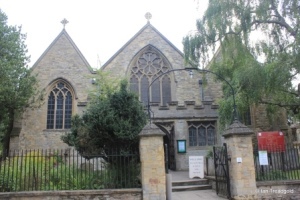 The major rebuilding of the church took place in C19 and Victorian times with the addition of the nave to the west of the existing tower and the provision of the two aisles to the north and south. 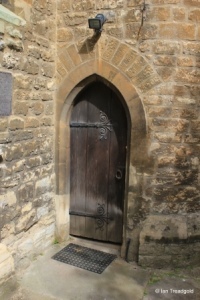 The south porch was added in 1902 and a vestry added to the north aisle when it was built. 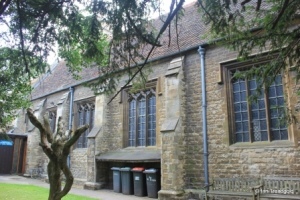 The modern chapter house was added in 1982. The south aisle contains three three-light windows under four-centred arches. 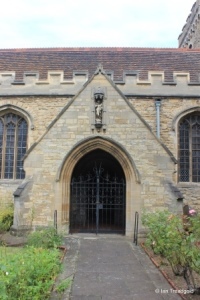 The south porch with its modern tiles has a roof descending quite low. 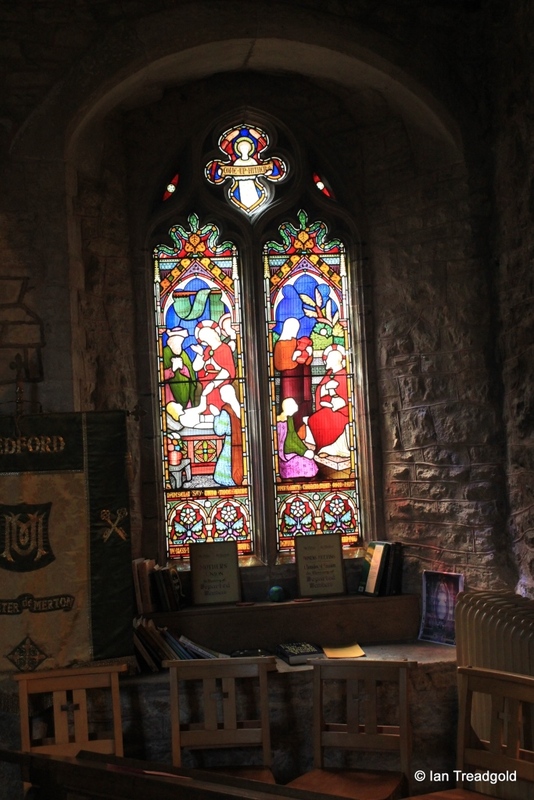 The west end of the church has two three-light windows in the aisles with a four-light window at the end of the nave. The narthex to the nave is embattled and there are gable crosses on each of the roofs. 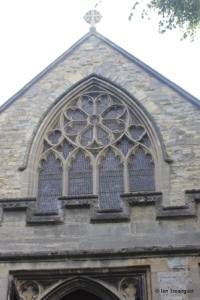 Whilst all the windows are modern, the nave window has a rose window as the centrepiece of the head tracery. The north side of the church has four three-light windows under square heads. 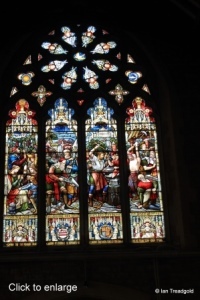 The east window of the chancel is an 1876 three-light window with cinquefoil tracery and unusual sexfoil tracery in the head. 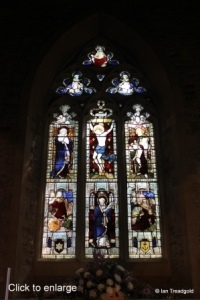 The stained glass in this window depicts Saints Mary, Peter and John. 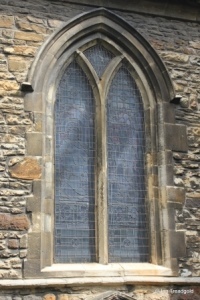 The south wall of the nave contains a plain two-light window to the east, a priest's door in a pointed arch and a smaller two-light trefoiled window with a quatrefoil in the head. 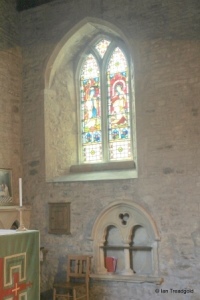 There is also a sundial attached to the south-east corner of the chancel. 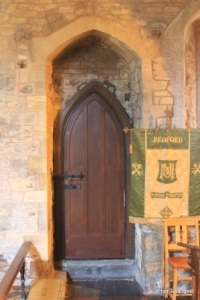 The priest's door is set inside a much taller arch on the inside of the chancel. 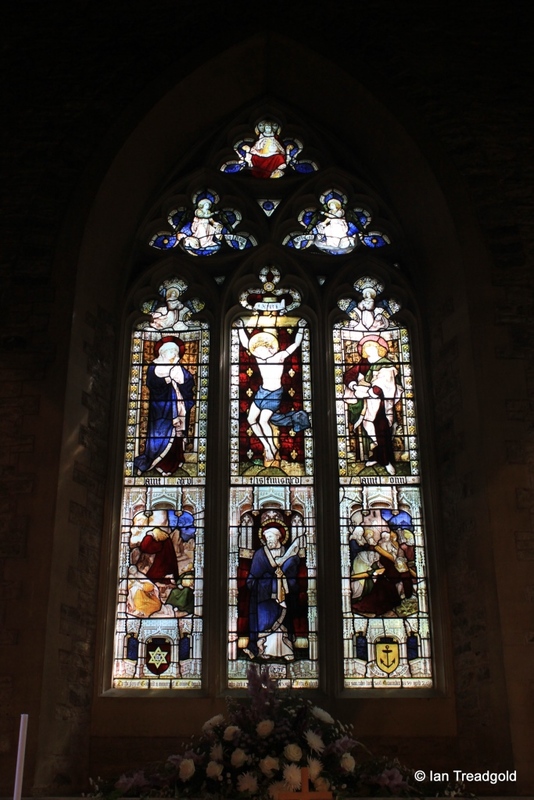 The plain two-light window contains Victorian stained glass and in the chancel has the piscina and credence below which are reproductions of the originals found during restoration work. 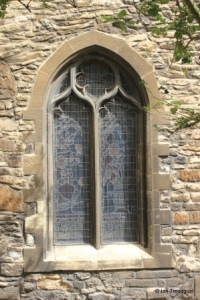 The smaller trefoiled window also contains Victorian stained glass. 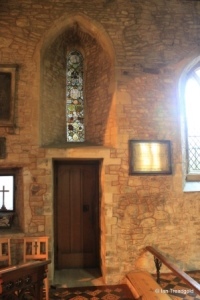 The tower is built of rubble and cement and has a modern corbel table and embattled parapet. 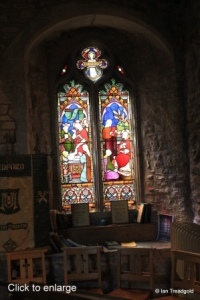 The belfry windows are round-headed arches containing two sub-arches with a central shaft. 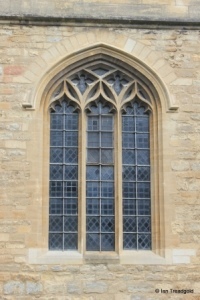 There is also evidence of two blocked windows at the level of the clock face. 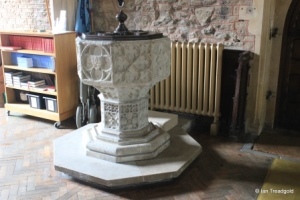 The font in the nave dates from C14 with intricately cut flowers in the decoration. 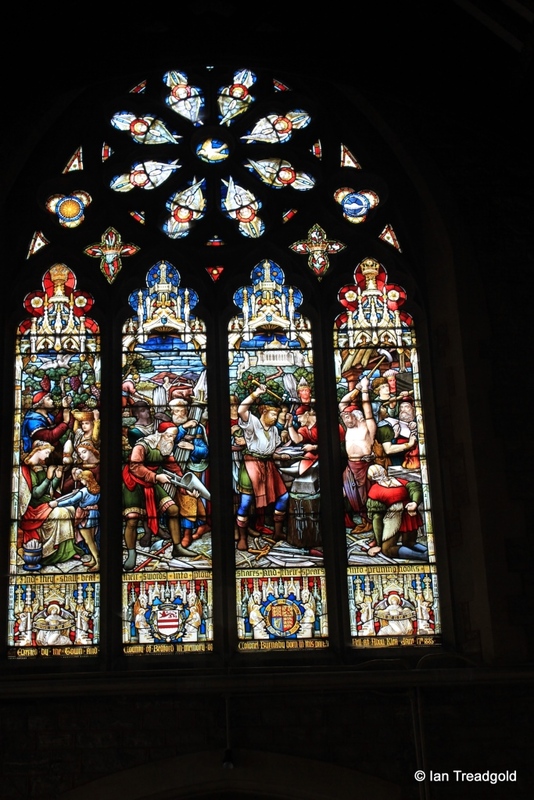 The glass in the lancet window in the chancel was collected from various places in Bedford and dates from C15, C16 and C17 with later glass being Flemish in origin. Page last changed 04/09/2014. Reformatted 25/09/2015.